In a large bowl, stir yeast into water to soften. Let rest for 5 minutes before stirring. Add cream/milk, eggs, pumpkin, oil, 1 1/4 cups whole wheat flour, brown sugar, salt, cinnamon, ginger and cardamom to yeast mixture. Beat vigorously for 2 minutes. Gradually add remaining flour (all purpose), a little at a time, until you have a dough stiff enough to knead. Start with about 1 1/2 cups and increase if necessary. Turn dough out onto a floured surface. Knead, adding flour as necessary, until you have a smooth, elastic dough. Combine the white sugar, brown sugar, cinnamon, allspice, ginger, nutmeg and cloves in a small bowl, set aside. Transfer the risen dough to a lightly greased work surface, and pat or roll it into a 16″ x 12″ rectangle. Spread softened butter over dough and then sprinkle with the sugar mixture. Roll the dough into a log the long way; it’ll stretch to about 20″ long as you roll. Using a very sharp knife, slice the log into 15 slices. In order to cut down on drag, it helps to rinse the blade in hot water, and wipe it off, between slices. Place slices in a greased 9×13 inch baking pan (or in two 8 or 9 inch round cake or pie pans). Cover with a towel and let rise until almost doubled, about 45 minutes. Bake in a preheated 375°F oven. Bake the rolls till they’re brown around the edges and beginning to turn golden brown across the center, about 20-30 minutes. 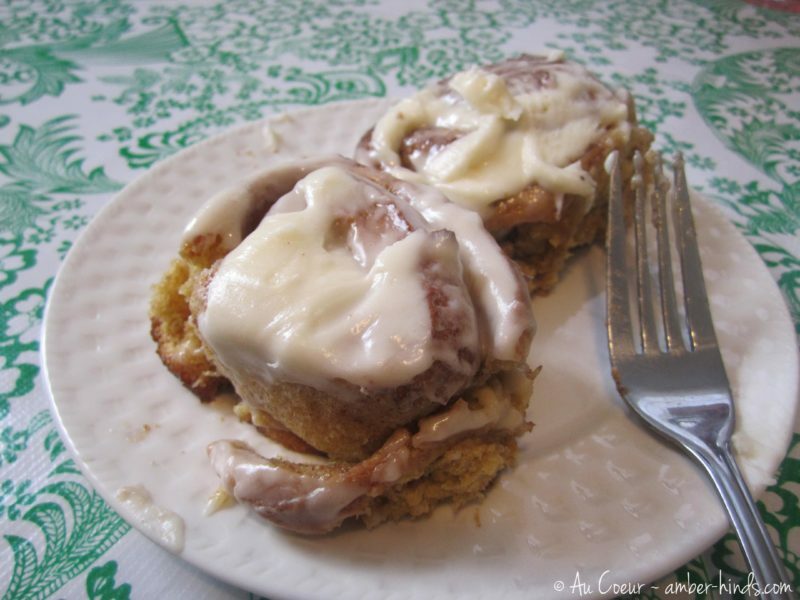 Frost warm rolls with the cream cheese frosting and serve immediately. For night before prep: What I did! Prepare the rolls up to the point where you roll and place in the pan. Then, cover in plastic wrap and refrigerate overnight. In the morning, remove the pan from the fridge and proceed with the instructions where you left off. Rising time will be longer than noted in the recipe due to the dough being cold vs room temp. My second rise out of the refrigerator took nearly 2 hours – it’s not about the time, it’s about the dough doubling in size.